Christmas is such a family oriented time, you'd think having a newborn would make it all that much better, but in reality, there's not a lot you can do with a little one when they are that tiny. We are now family, and that will make it the most memorable year regardless of what we do, but that doesn't mean I've not said numerous times how excited I am for Christmas next year. I can't wait for Harrison to be a year old and able to do so much more. In saying that though, I'm extremely guilty of wishing away the moment we're in right now: just because Harrison doesn't really know what is going on doesn't mean Christmas this year doesn't have it's own little perks. 1. Christmas shopping with a pram as a weapon is much easier. I've never hated Christmas shopping as much as I have this year. Somehow though, I don't think it'll be as easy as it is right now. Not only do I have a baby who sleeps like a log whilst I fight with other angry shoppers for gift sets and wrapping paper, I also have a very big pram which gives me a distinct advantage for fighting through the crowds. No one can judge a mum for not judging distances properly and ramming a wheel or two up a heel... I promise it was an accident. 2. Enjoying the last year with no Elf on the Shelf. I'm so excited for Elf On The Shelf right now, although I can guarantee this time next year I'll be regretting ever starting it. Find me one person that still enjoys Elf by the 24th December and I'll give you a medal: the same could be said for many of the other traditions we'll be starting with Harrison. This is the last 'easy' Christmas we'll have for a decade at the very least, and I'll be using every opportunity to take advantage of snuggles on the couch and easy walks with the pram. 3. Dressing up a squishy baby as a reindeer is like nothing else. 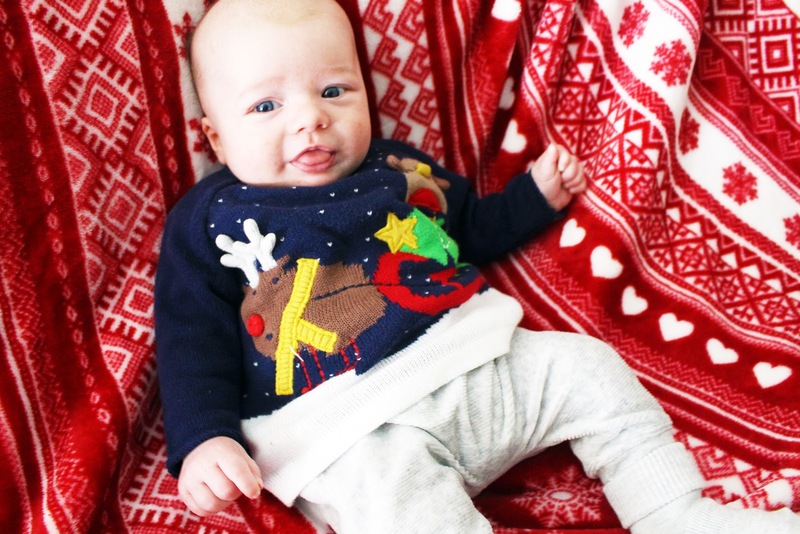 Anyone who's been reading my blog will know that since the first of December I've had Harrison in a different Christmas outfit with every day of advent. It's safe to say I'm only going to get worse as it gets close to Christmas, and we may well need to start doing two outfit changes a day to make sure Harrison isn't still dressed as Rudolph come Easter time. I'm sure Harrison will still be adorable at one years old, at two, at three dressed as a Snowman, but I think most would agree that he'll never be as cute then when he's a squishy newborn in a Santa suit. 4. I'm free of wrapping. I have one more year of not having to wrap a mountain of presents on Christmas Eve - I know I'll say that I'll be organised and wrap as I buy, but lets face it, that will never happen, and every year for the next 20 I'll be sat at 3am on the night before trying to desperately get everything wrapped in time for Santa. It's about time Santa started doing his own dirty work. 5. All the more excuse for cuddles on the couch. I've never spent so much time on the couch as I have in the past two months, and I don't even have to feel guilty about it. I'm all but expected to spend all of my time indoors for the first few months, so I'm making the most of the ability to wrap up in a blanket and take all the newborn cuddles I can get. In a few years time I'll be fighting for those cuddles, and I doubt I'll manage to make Harrison sit still on the couch when he's surrounded by Santa's presents. I'll be extremely lazy this year, and I won't even feel bad. I couldn't not buy Harrison an advent calendar, that just wasn't fair. Given that he won't be touching chocolate for a long time though, that means one thing and one thing only: double advent for me. Or in my case, triple, as I can't help but nick Jordans when he goes to work... Again, I don't even have to feel guilty about eating all of this chocolate, I can gain as much weight as I want this year and no one can say anything, I had a baby two months ago and that's my excuse. Now,where are my pigs and blankets? For the rest of this year, my plan is to really try and live in the moment rather than wishing away time. As much as I can't wait for Harrison to sit up, and to crawl, or walk, I'm just as happy when he giggles, or smiles properly, and I want to make sure I really appreciate these moments while I can. 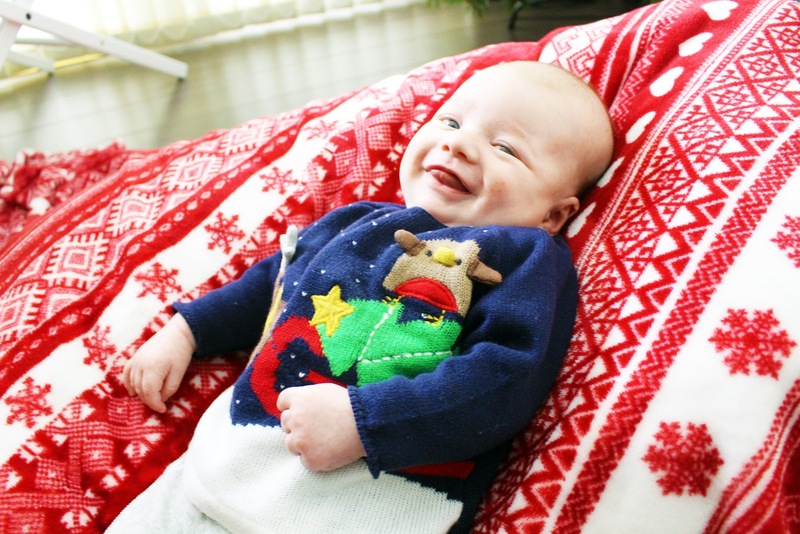 It really is so true that the newborn days go so quickly, and I really do want to make the most of them while I have them, whether that be taking advantage of my cuddles on the couch, or ramming people with my pram.